Let’s be reductionist. There are two kinds of poets: those who use titles and those who do not. Notice I say “use,” not employ—there’s a difference. When I say “use,” I mean titles that bleed into the poem, titles that serve as markers, titles that serve as guideposts, titles that tilt the axis of the poem. Titles that act like a gel, casting a blue or a yellow or a red light across the body of words. Painters, I suppose unsurprisingly, can be categorized the same way. Poets and painters are image-makers. Each picture is or is not the punch line to the finished piece. Edward Mullany is the first kind of poet. He uses titles. But in a time warp way. His pictures are the punch line to the title. The way the title comes first, the way we read forward and then back again—did we miss some—oh, no, we didn’t—drives us to pause, consider, to navigate and re-navigate this collection. So many of these titles, in fact: “The New Crucifixions,” “The Knives that Were Found on the Highways,” “The Plague,” “The Swarm of Mosquitos,” “The Statues of Weeping Women,”—create a subtext that somehow sits atop its subject, an unsubtle secret code. There’s something else, we worry, happening here. In a poem like “The Swarm of Mosquitos,” repetition and simplicity carry the piece, create a loop – have we been here before? What exactly is happening? It moved toward the city. Then it moved through the city. This contrast, this specific ambiguity, is fitting for a work that works on painting a post-apocalyptic future a lot like our now. It looks so much like a mind-wrecked now—or maybe just now?—that Mullany’s simple, stark lines create that skin creep, that sense of déjà vu. We read them and wonder about the shadows gathering and think, maybe we’re living in the apocalypse already. It’s quieter than we thought it would be, here at the end of the world. And of course, that’s the beauty of the very brief, very spare poems Mullany includes in his collection. This future, or past, or present – this devastating emotional landscape Mullany paints for us– is the quiet sad of after, of too-late. The backwards-forwards-ness of the titles only serve, as we dig deeper, to remind us of that. That we’re reading in the wrong order. That we’re living in the wrong order, our troubles laid bare before they even begin, our sadness deeper than it should be for things still to come. Does the man in “The Plague” know there is a plague? What kind of a plague? Is it metaphorical? Does it matter? We sense the man is doing it wrong, it feels wrong, but perhaps, again, there is a kind of going backward here, a kind of stripping of ourselves. Mullany paints him “naked in a hotel room / he had emptied of everything not / bolted to the floor.” In the last days of what’s left, Mullany gives us the loss of things – the rejection of our own accumulations. And in a way, this poem is particularly emblematic of the collection as a whole: Mullany’s apocalypse is quiet, barren, lonely. We sleep apart. We give away our things. Like Nero, we fiddle, but ours is a sadder song. We survive, just barely. And just some of us. If you flip through the book quickly enough, you’ll read the story of the world’s end in a heartbreaking minute. Read it again, this time slowly, this time closely, and something else is at work here. First, it was dark. Then the sun began to come up. Then a crowd began to gather. Then a group of naked men and women were led into the courtyard. Again the short, simple sentences. Again the single or two syllable words. Again the people, naked, stripped. We know what comes next. We know what boiling means. But Mullany refuses to make it so easy for us. He refuses, throughout this book, to provide the easy apocalypse that we sweat through and then forget, like a slasher film. There are no slashers here. There are only befores, and maybe-afters. And the worry that this is maybe-us, or will be. 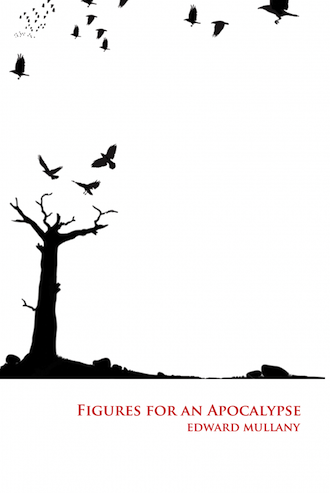 Edward Mullany’s powerful, terrifying record of the apocalypse is not for the gore-thirsty, nor the impossibly hopeful. It’s a sad, quiet record of the unwinding death of man. And a not-so-subtle reminder, as it shifts about in time, that we’ve already started to die.